Former Penn head coach Jerome Allen, now an assistant on the Boston Celtics coaching staff, is accused of accepting a bribe by a Florida man to recruit his son to the prestigious Ivy League college, according to the Miami Herald. Philip Esformes, a businessman at the center of a massive Medicare fraud case, is charged with paying roughly $75,000 in bribe money to Allen via wire transfers, hotel rooms, private jet travel and limo transportation. Charges announced Friday allege Esformes of using proceeds from defrauding the taxpayer-funded Medicare program to pay Allen. 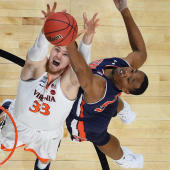 The goal in bribing him appears to have been to list his son, Morris, as a recruited basketball player to help support his application to the university. The bribery seems to have paid off, too. Morris Esformes was accepted and entered the university in the fall of 2015, however he did not make the Penn basketball team. It's not clear at this time if Allen is facing charges for accepting the payments; he remains a member on Boston's staff, and the franchise chose not to comment in the aftermath of the discovery this past weekend. The indictment released Friday did not name explicity Allen nor Penn, but Howard Srebnick, an attorney for Esformes, said prosecutors disclosed in court that Allen was receiving the payments from Esformes during his stint at Penn. Despite failing to make the basketball team at Penn, the younger Esformes has maintained a 3.6 GPA at Penn and is slated to graduate from the Wharton School of Business with the Class of 2019. Allen resigned from his post at Penn following a dreadful 2014-15 campaign that netted the Quakers a 9-19 overall record and a last place standing in the Ivy League.